The Expert Pro radically reinvents audio by combining the core elements of playback into a single slab. The preamp, amp, DAC, streamer, and phono stage functions are tightly integrated for audiophile sophistication with extreme musical accuracy and precision. This design delivers the best performance measured at all power levels. All Expert Pro products feature the latest Devialet technologies. 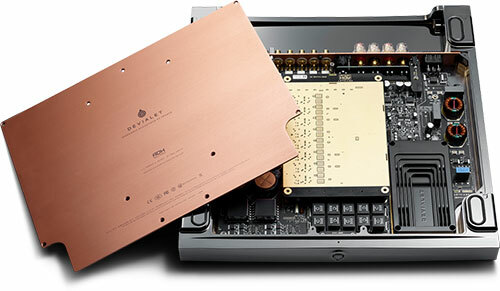 Active Digital Hybrid (ADH®) was invented by Devialet to drive speakers with a class A voltage amplifier in parallel with class D current amplifiers. The result is high linearity and refinement found in class A with the power and compactness found in class D. Passive constant power dissipation throughout the aluminum chassis ensures undetectable levels of thermal distortion. Speaker Active Matching (SAM®) analyzes specific speakers using laser technology and crossover measurements to generate a unique profile for perfect amplifier and speaker matching. When applied, the SAM profile ensures temporal alignment and further low-frequency extension. Magic Wire® moves the DAC to 5cm from the speaker output to minimize any chance of external influence on the preamplified audio signal. As a result, the current-to-voltage conversion, anti-aliasing filter, and gain stages can be considered a single unit. Asynchronous Intelligent Route (AIR®) is a custom designed audio streaming protocol for use over Wi-Fi and Ethernet. Stream up to 24-bit / 192kHz from your Mac, PC, iOS, or Android device in asynchronous BitPerfect or asynchronous fixed broadband modes. Asynchronous BitPerfect delivers audio data with zero modification and at the exact same rate as the Expert Pro digital-analog conversion. Audio data is buffered for reliable playback with minimal jitter. Record Active Matching (RAM®) allows you to precisely configure the phono stage input impedance and capacitance to match your specific MM or MC cartridge. The equalization curve can also be customized for optimum playback. Digital audio capture is also supported over the USB connection. The EVO® platform is a unique architecture that ensures your Expert Pro will always support the latest features and upgrades. Key functions such as power conversion and core management are software controlled. Firmware upgrades are always free. Core Infinity is the latest Devialet hardware platform and operating system to provide future-proof long-lasting performance. The Core Inifinity board is built around a quadcore 1GHz ARM processor, 1GB of DDR3 memory, and 4GB of Flash memory. Additional features, signal processing algorithms, and future audio formats will be supported by an FPGA, second DSP, three ASRCs, and an improved USB interface. Radio remote control included. iOS and Android control apps. Roon Ready. RS-232 automation control.